Sri Lanka’s abysmal record in dealing with alleged war criminals is well documented. 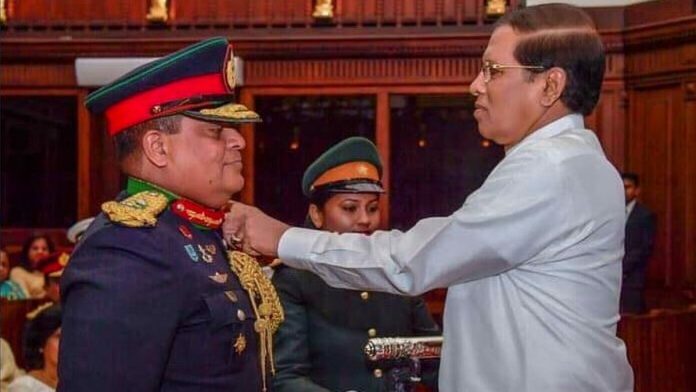 And, with the recent appointment of Major General Shavendra Silva—an alleged war criminal—as second in command in the Sri Lanka Army, the South Asian nation has drawn fresh international ire. In 2012, he was removed from a UN advisory committee due to alleged war crimes and other egregious violations. That same year, he was prevented from assuming a diplomatic position in South Africa. Yet, in March 2017, Silva was appointed adjutant general of the Sri Lanka Army. His recent promotion attests to the fact that in Sri Lanka, the more things change the more they stay the same. In October 2018, Sri Lanka entered a period of profound crisis. President Maithripala Sirisena fired Prime Minister Ranil Wickremesinghe and replaced him with his erstwhile ally Mahinda Rajapaksa, an alleged war criminal who served as president from 2005 to 2015. The coalition government that had ruled for the past several years deteriorated. Chaos and confusion engulfed the country for over seven weeks; Sirisena and Rajapaksa trampled the constitution and Sri Lanka lacked a functional government. The crisis appears to have settled—the coup attempt failed—and Wickremesinghe has been reinstated as prime minister. In the days leading up to the crisis, an important development went largely unnoticed. The United Nations (UN) requested that the commander of its peacekeeping force in Mali, Sri Lanka’s Lt Col Kalana Amunupure, be sent home. The request was the result of new evidence pertaining to his human rights record—his involvement in crimes against humanity that were committed during Sri Lanka’s civil war. And Amunupure was not the first to face such accusations. His repatriation was the result of efforts by the International Truth and Justice Project (ITJP), an organisation that has done excellent work to record the egregious human rights violations committed by Sri Lankan security personnel. ITJP has continued to document major violations which have occurred since Sirisena became president in January 2015. Amunupure played a notable role during the end of Sri Lanka’s civil war and it would be utterly naive to think he doesn’t have blood on his hands. Of course, a deeper and more thorough examination of Sri Lankans hoping to become UN peacekeepers is long overdue. After all, the consistent shelling of hospitals and the slaughter of Tamil civilians (among a range of other appalling human rights violations) have been documented extensively through credible investigations and reports. The Tamil Tigers too committed wartime violations, but virtually most of their leadership died during the war—it is widely believed that the majority were killed extrajudicially by Sri Lankan government forces. Accountability for Sri Lanka’s wartime abuses—if at all—is guaranteed to be a long, hard slog. And let’s keep in mind that there is not going to be any real accountability through a purely domestic (Sri Lankan) judicial mechanism. In such a milieu, an international mechanism is essential. Sri Lanka, of course, doesn’t want such intervention. President Sirisena has made it abundantly clear that members of the Sri Lankan military will not be held accountable for wartime violations. What is more, significant security sector reform—which the country urgently needs—has never been on the agenda. Besides, given the recent political crisis in Sri Lanka, it is clear that the window for meaningful reform will remain closed in the foreseeable future. Sirisena, unsurprisingly, has promoted alleged war criminals on other occasions and will probably continue to do so. Repatriations obviously don’t constitute justice. They are, however, reminders that the way the country’s civil war ended remains relevant. These war crimes allegations aren’t going away. In fact, Sri Lanka’s continued failure to address wartime crime foments impunity in a country that has already witnessed much violence. In recent times, Tamil affairs have ostensibly gained currency because Colombo had sought to placate international actors, deflect international pressure and differentiate itself from the Rajapaksa regime. But the fact remains that Colombo doesn’t care about addressing Tamil grievances. And Silva’s appointment sends a very clear message to the Tamil community: Tamil issues don’t matter to the central government. They certainly didn’t when Rajapaksa was in power. And, now that he’s out of power, they still don’t. The author is an Adjunct Fellow at Pacific Forum. Follow him on Twitter @taylordibbert. Therefore no mercy to be shown to such terrorists and to those who support them. Sri Lankan Army literally had to fight inch by inch to defeat them and in the process they did what was required by any professional force to do so. Yes, civilians do get killed in war, unfortunate but a fact of life. But here a large number of these civilians were the eyes and ears of the LTTE which also recruited its cadre from these very civilians. A lot of false propaganda is being unleashed by LTTE surrogates who are using their financial muscle to discredit Sri Lanka and its Armed Forces. But what is most important is that now there is peace in Sri Lanka and people on both sides are trying to forget and move on. By being part of such false propaganda you are trying to destroy the peace.